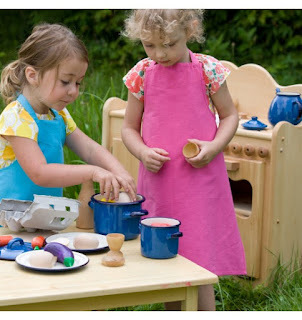 A question that repeatedly arises on the facebook natural toys buy/sell/trade group is about nontoxic toy kitchens. Many "wooden" kitchens made by larger manufacturers are made of particle board and/or plywood, which can often contain formaldehyde. 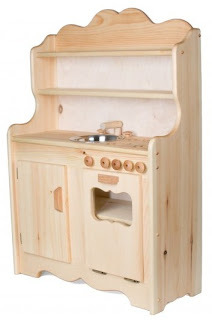 While there are a number of companies like Wonderworld and Hape that do make eco friendly, formaldehyde free kitchens, there are so many crafters in the US that make gorgeous, solid wood kitchens for almost the same price. Of course I have to start with the kitchen we settled on. 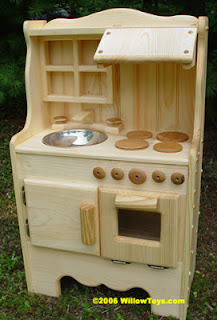 I love it because of the hutch and the extra little counter space. 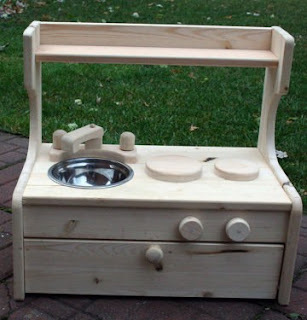 I looked long and hard to find one that had space beyond just the stovetop and sink to play on. We have Sylvie's kitchen, and there are other models with hutches or without, and there's a matching refrigerator. It's just gorgeous and beautifully made. When we got it she could barely reach the top shelf. She loved it then as much as now two years later, and I'm sure she'll continue to for many years to come. Palumba's kitchens by Camden Rose are simply stunning. Crafted of curly maple or cherry with walnut and birch accents, these kitchens are also made to last for generations. They have a slide out additional counter space, and can be purchased with or without the hutch, and they have matching refrigerators too. 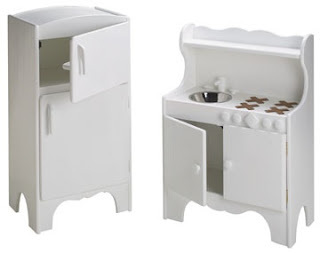 Willow Toys has seven varying kitchen models, including this adorable one with a hood and window. They also carry a hutch and dry sink, as well as a refrigerator. 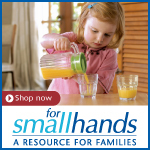 If you're looking for something available in different color options, as well as a natural finish, at a slightly lower price point, Little Colorado makes kitchens, refrigerators and other accessories. 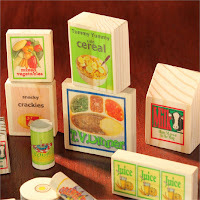 While they are not made entirely of solid wood, I received this response from the manufacturer: "The Medium Density Fiberboard used in our products is manufactured by Plum Creek in the United States and is certified green. 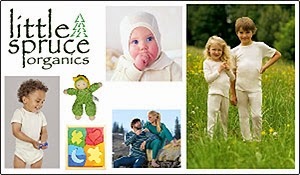 Links to Plum Creek’s website which provides product specification information here. 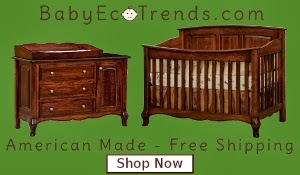 Wood products are never totally formaldehyde free because trees in their natural state, as all living things do, contain formaldehyde, so it would be factually incorrect for me to tell you that the wood products we use are formaldehyde free. That said, we use MDF to provide a solid grain and knot-free surface on which to apply our finishes (which are low VOC). 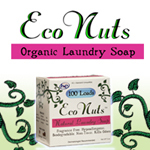 We use Plum Creek because it is certified green and because as a USA manufactured product, we know there is regulatory oversight and testing. The recent scares concerning the high formaldehyde level glues used in MDF were on MDF imported from China." From the site: "All Products are Made in America by Americans. We use American made paints totally free of lead." 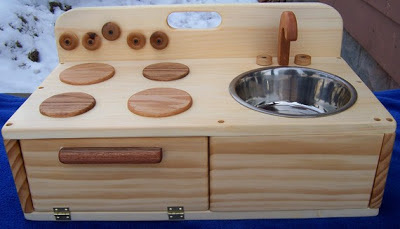 This adorable tabletop kitchen optionally comes with everything you need to start cooking, including a basket of fabric vegetables, stainless pots and pans and wooden utensils. All for a very affordable price! Retails for $40 for just the kitchen, $60 including all the accessories. Mama Made Them toys are gorgeous, and they are made by a single mother on a mission to have affordable, quality toys for her son. 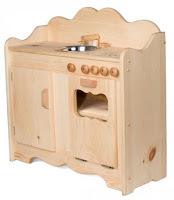 This kitchen is made of solid pine with a natural beeswax finish, has a mini oven and can be used on a tabletop or free standing. It sells for $100 with FREE SHIPPING. 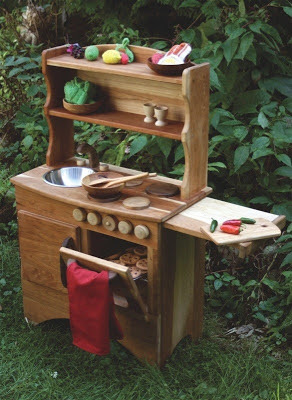 This mini kitchen is made of Canadian woods (mostly pine, cherry and maple) and is a great size for a smaller space. It has a hutch, and some storage/oven space as well. It retails for $90 plus $45-$60 shipping. 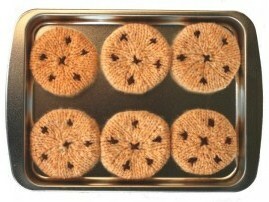 To go with their gorgeous kitchens, Palumba carries an amazing selection of pint sized kitchen accessories and food, including a favorite in this house - the sheet pan of knitted cookies. The pan is very heavy duty, in fact, heavier than some real pans I've had! The cookies are nice and thick and after a year of frequent use everything still looks brand new. The porcelain enamelware at Nova Natural is unique and beautiful. It is my understanding that it can be used on a stove as well. 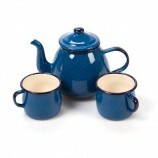 They have place settings, pots and a tea set available, as well as other kitchen related items. The porcelain coated steel is lead free and made in Poland. 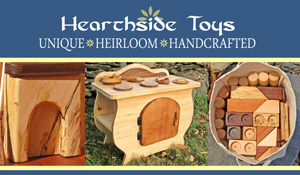 Looking for quality, hand crafted accessories and food for you kitchen that's made in the USA? Look no further than Forever Afters! 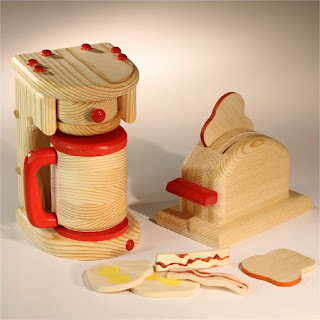 They make things like coffee makers, toasters, microwaves, play food and much more. I was really excited to find them, and while I don't have any personal experience with their products, they look truly amazing! 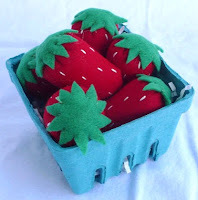 While a quick search on Etsy.com for "felted play food, knitted play food, or wooden play food" will turn up literally thousands of results of beautifully crafted items, here are a few of my window shopping favorites! 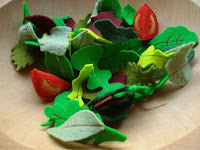 Mixed Baby Greens Felt Salad by Dashing Bean - I just loved how unique this was, and there is also a set of wool bow tie pasta that's adorable! 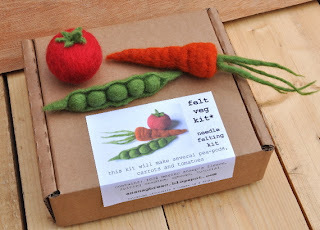 mkneedlework creates very affordable felt food items that look very nicely made, like this veggie set. 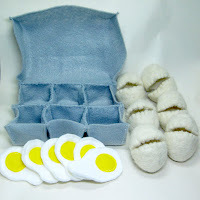 The first time I tried needle felting, I was shocked at how easy it was. Kits like this one by An Snag Breac are a fantastic introduction, and often include everything you need to get started. Once I completed a similar type of kit (mine was an owl by cute little thing), I had the confidence to branch off on my own future projects. Wool roving is available on etsy.com as well as some crafting retailer sites for future felting projects. 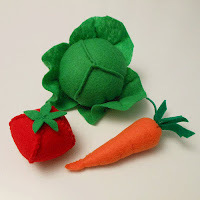 Etsy is also a great source for play food patterns, or just DIY inspiration! 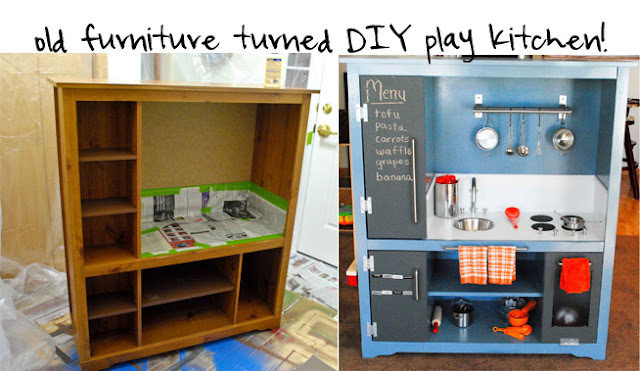 Pinterest is certainly a great source of DIY inspiration, but Ashley Hackshaw of Lil Blue Boo has compiled a nice collection of DIY toy kitchen transformations from ordinary furniture. She has also done a list of play food DIY ideas. I love those diy ones! That's a great idea. Those entertainment center furniture pieces are always being given away too, so you could make one for practically nothing. Modern accessories is very much helpful in making our work simpler. I have a doubt about renovating the kitchen. Is hard wood a good option to make kitchen cabinets?